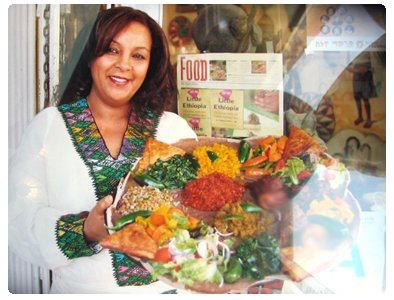 Owner and chef Rahel Woldmedhin is not new to the restaurant business, with over 25 years of experience. She was the original owner of Messob, the Ethiopian restaurant just next door. While her previous experience operating Messob focused on cuisine for omnivores, Rahel made the bold decision to open a new restaurant that offers her native cuisine with an all-vegan menu. New to the vegan path, she is experiencing renewed energy and improved health that many of us enjoy regularly.